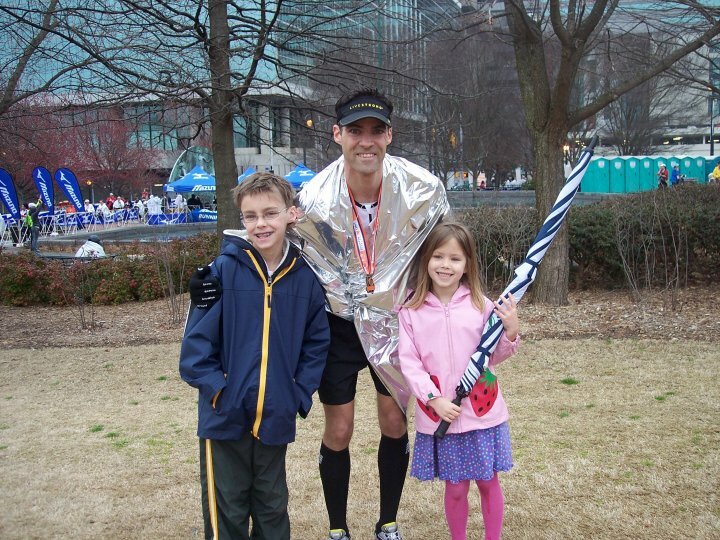 Tales of a Southern-Fried Yankee's quest to become an Ironman finisher. A Massachusetts-born, New Jersey-raised, Atlanta resident. On May 4, I signed up for my first-ever triathlon. People train for months, sometimes even years for these things. I gave myself 18 days. I’ve been thinking about doing one for a couple of years, so that should count for something. The race is the 11Global Olympic-Distance Triathlon at Reynolds Plantation. I discovered this race a couple of months ago while searching for triathlons in the Southeast U.S. This is a relatively new triathlon series, but from what I can tell it looks to be a well-organized, well-run series. First and foremost it’s an International or “Olympic” distance, which I think should be somewhat manageable for me. It will be hard, but not impossible, I figure. The race is scheduled for May 22. I had thought about signing up for it back in March or April but couldn’t pull the trigger. On May 4, I went ahead and signed up. What the heck, I figured. There were a couple of problems that immediately jumped out at me, however. 1. I don’t own a road bike. 2. I haven’t done much swimming in a long time. 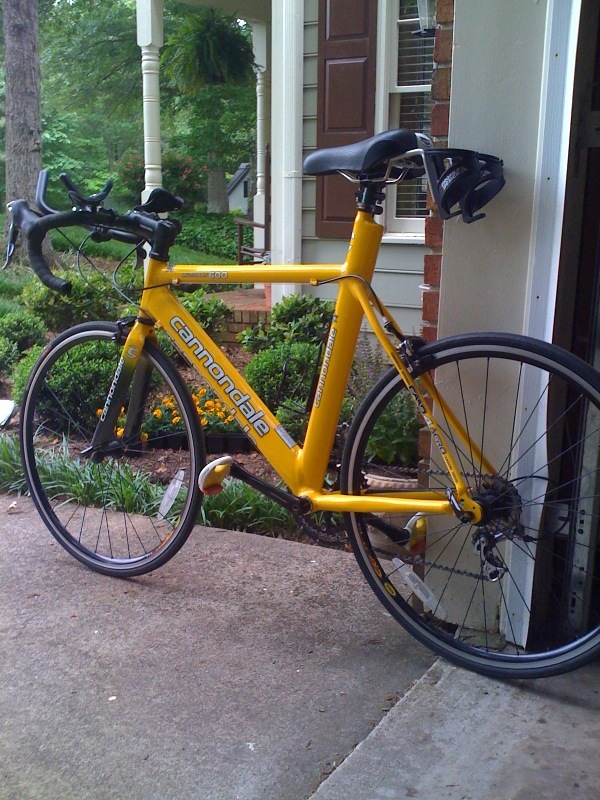 Problem # 1 was quickly solved when a neighborhood friend said I could borrow her husband’s used Tri bike. It’s a Cannondale Trisport 600. I first had to determine if it would fit me. So I stopped into a store to get measured. Sure enough, the bike is 54 cm, a perfect fit for my 5’9″ inch body with a 30-inch inseam. Jackpot! Next, I need some shoes. Since I don’t want to spend a ton of cash for something I’m not sure if I want to continue doing, I stop at a Play it Again Sports store and find a pair of used size 8 bike shoes for the low, low price of just $18! Jackpot # 2. I then go over to the local bike store, Roswell Bicycles, and pick up some clips that match the bike’s Look pedals. I’m in bidness! (as the kids say). The clips I need end up costing just $15! Woo-hoo. I grab a couple of water bottles for the bike while I’m there, too. Getting back on the bike has been a fairly easy transition. Some of my thigh muscles have been hurting more than usual and the saddle has rubbed me the wrong way a few times, but it’s nothing that I can’t get past. I used to ride a LOT as a teenager and in college on a Specialized road bike I had. I absolutely loved it at the time and find myself really excited to get back on the bike after about 20 years. Thankfully, my running has kept me in decent shape and the hills don’t prove to be too difficult on the bike. For my second ride, I decide to get right after it and map out a 26-mile ride, followed by a 6-mile run. The ride included a bunch of flat sections and several hills. Getting used to riding in a forward position with my arms on the Aero bars takes some getting used to, but I pick it up pretty quickly. I ride back to where I parked my car, jump off the bike, throw it on the bike rack, slip on my shoes and take off on the run portion. If you ever want to know how a newborn calf feels, ride your bike for a long time, then try to run right away. Holy Jell-O legs, Batman! For the first mile, my legs are as wobbly as an 11-month old baby’s. Finally, I settle in and bang out 5.5 miles. I end up cutting the run a bit short because I needed to get home. But it was comforting to know I could do the distances without a problem. Ugh, I quickly discover that the swimming part is going to be my toughest challenge. I suspected it would be, but I had no idea just how hard! I quickly tire after just a few laps. I got back two more times on my own and work hard to focus on my breathing and technique. This video from Ironman champion Dave Scott is helpful. Eventually, I enlist my neighbor for some help/advice. I have NEVER worn one before and I desperately wanted to see just how much it was going to help me in the water. As soon as we get in the pool, I feel myself floating. Awesome! This is a HUGE relief for me. However, the wetsuit isn’t going to actually do the swimming for me. I still have to work on my stroke and breathing. It’s HARD work. I feel like I did when I first started getting into running. I am not in “swimming shape” at all. Still, I’m not so out of shape that I can’t get through the workout. Kate is like a dolphin. I’m jealous of how effortless she is in the water. Sigh… She tells me that she did a lot of breaststroke in her first triathlon. I’m relieved to hear that. Her advice (which I plan to follow): “Don’t push yourself on the swim.” My plan is simply to finish the swim and then attack it on the bike and run. I am looking forward to catching and passing people on the run! (I hope). Next, I am planning a few more long rides/run before getting back in the pool at least 3-4 more times before the race. Either way, I’m happy I decided to challenge myself, even if it might be a tad bit crazy. What an awesome day. Plain ‘n simple. 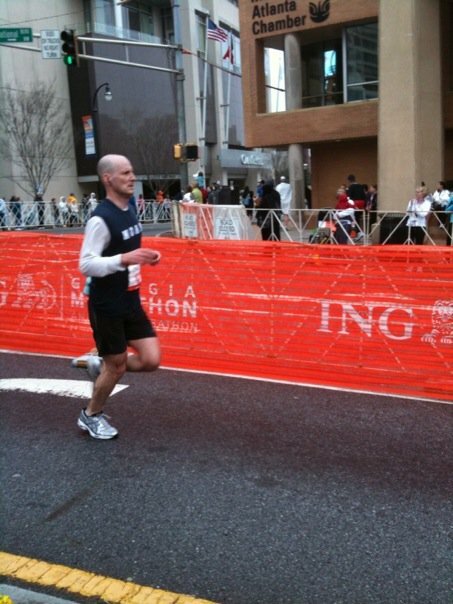 This was my second year running in the ING in Atlanta. Last year, I did the half marathon as my first-ever half marathon (1:42) and promised the guy leading my pace group that I would be back a year later to run the full 26.2. I didn’t break my promise. This time, I piled into a car with some neighborhood friends and made the short drive downtown. It’s awesome to be able to run such a great race in your own backyard. However, the convenience of the race produced some real scatterbrain moments on my part. First, I walked away from my car without my water bottle belt. I got a block away and had to run back to the parking garage to get it. Then, while waiting to meet up with a friend in Centennial Park, I realized I also left my timing chip in the car. DOH! I had to run four blocks to get back to the car and run back to the park. When I finally got my act together, I waited in the park until about 6:45 to meet the friend I was supposed to run with. In the end, we never found each other. He wanted to run a 3:45, but I secretly wanted to try to break 3:30. So truth be told, I wasn’t entirely upset that we never met up. Here he is coming in at 3:44. I head to Corral C, listen to the National Anthem, and quickly we take off. I cross the start line about 50 seconds after the gun. Now that I don’t have my running partner, I have to develop a new race plan on the fly. I spot the 1:45 half marathon pace group and realize this is an 8-minute pace. I decide to hang with them for a while. This is a perfect pace for me for 13 miles, but I wonder what I will feel like over the second half of the race. And look at that… the 1:45 pacer was the same guy from a year earlier. I make my way over to him and remind him that I promised him I would be back. He wished me luck and off we went. Throughout the course, my plan to preserve energy is take it real easy on the uphill sections (there are a LOT of them) and go at a controlled pace on the downhills to keep from blowing out my quads. Then I will push the pace a little on the flat sections to make up time. Anybody who has run the ING in Atlanta will tell you that the flat sections are so valuable because the hills can be so punishing. You need to take advantage of the “easy” sections when you can. At least that’s what my game plan was. While I wasn’t familiar with the entire course, I had scouted out some key sections in the weeks leading up to the race. I even took the time to run a really hilly 4.5-mile section through Druid Hills. 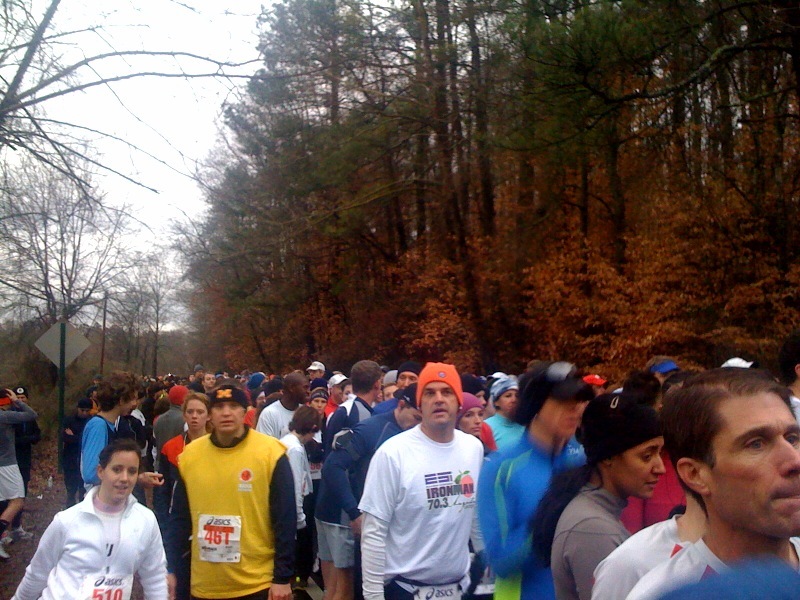 There are a lot of hills in Druid HILLS…. I know, go figure. This was a HUGE learning step for me, and it really paid off on race day. When it came time to tackle that section, I was ready for it — unlike my experience in NYC when the Queensboro Bridge completely wiped me out! — In Druid Hills, there are about 4-5 hills in a row, with each one a little worse than the next. This section was clearly taking its toll on some. I passed about 5-6 runners who had sped past me earlier in the race. These same speed demons were now walking up the hills, hunched over and gasping for air. I smiled a little on the inside…Does that make me a bad person? I think not. In Druid Hills, knowing what was coming was more of a mental thing for me. As I passed one runner after another struggling on the hills, I felt a huge sense of accomplishment. As much as my scouting trip helped me, the biggest lesson I learned from this marathon was to hydrate, hydrate and hydrate some more. In NYC, I blew off many of the early water stations because I “wasn’t thirsty.” BAD mistake! I completely cramped up in my legs at Mile 19 and barely finished. I wasn’t about to make that mistake again. For this race, I drank about four 16 oz. water bottles with Nuun electrolyte tabs in them the day before. Then during the race, I make sure I grab some Gatorade at almost every water station. I think I only skipped one water station for the entire race. In addition, I ran with two water bottles on a belt and used them to wash down a Gu pack (Gu Roctane Blueberry Pomegrante flavor) about every six miles or so. I even had a few Gu Chomps to chew on at various points of the race. That may seem like a lot to some, but it worked for me. By the time I reached Piedmont Park, I was still felling pretty good and picked up the pace a little through the park. Then I exited the park… WOW! There is section up 12th Street that leads to Spring Street… No words can describe this hill. I was determined not to walk up it. Not for a single step. I made it to the top, “running” the entire way. You can see the hill here, at about Mile 23. I’m not sure who you people were standing on the side of the road on this hill clanging your cowbells and cheering, but you get the gold star from me! Without these fine folks I’m pretty sure this hill would have destroyed me. Once I make it up this hill, I know I’m home free. As we make the turn for downtown, I spot the CNN sign up ahead and head for home. As I make my way down the final stretch, I try to keep and eye out for my wife and kids. I look on both sides of the street over the final mile, but can’t find them! My wife snapped the picture above right about at the moment I see the clock and realize I can break 3:30! I’m so pumped that I don’t hear them yelling for me… It didn’t help that I had my headphones in either I guess. After I cross the line, I take a second to gather myself. When I realize that I have now accomplished the third goal on my list of four goals this year (break 3:30 in a marathon — DONE, break 1:35 in a half marathon — DONE, break 42 min in 10k — DONE and break 20 min in a 5k — NOT done, yet.) I give myself a huge fist pump. After all, running is a solo endeavor, for the most part, and if you don’t stop to give yourself a fist pump every so often, who will? A split second after my fist pumping subsides, I hear “DADDY!” from the other side of the fence. 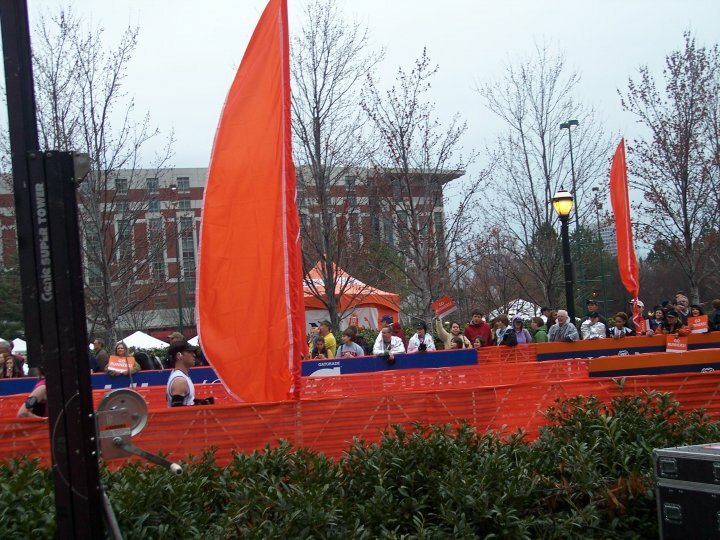 I spot my daughter running through the crowded finish area. We meet over at the fence barrier. Hugs all around. My son give me a high-five. I snag a kiss from the wife. My day is complete…. Now, when can I do it all again!? This post has been a LONG time in the making. 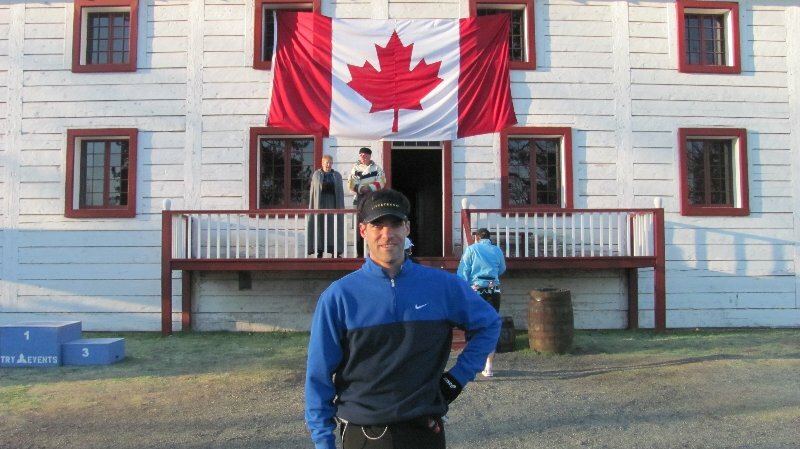 But with the ING GA Marathon on the horizon, I figured that it was about time share some of my recent travels/running news. To sum up the past month… WOW! In my previous post, I said that running with the Olympic Torch was a special treat, but as it turns out, it was only the beginning of my adventure. I spent three weeks in Vancouver/Whistler for the Games covering a variety of events, including the Gold Medal hockey game between the U.S. and Canada. Simply put, it was the greatest game I have ever been to. I also went to the snowboard halfpipe, some short track speedskating, figure skating and luge events. A colleague of mine kept a great blog of our adventures, so rather than re-hashing everything here, you can read more here. Because most of my work days were between 13-16 hours, keeping up with my running schedule became very difficult at times. I usually had to run REALLY early in the morning in order to get it in. Running along the Seawall in downtown Vancouver and through Stanley Park are truly two of the most beautiful places I have ever run. 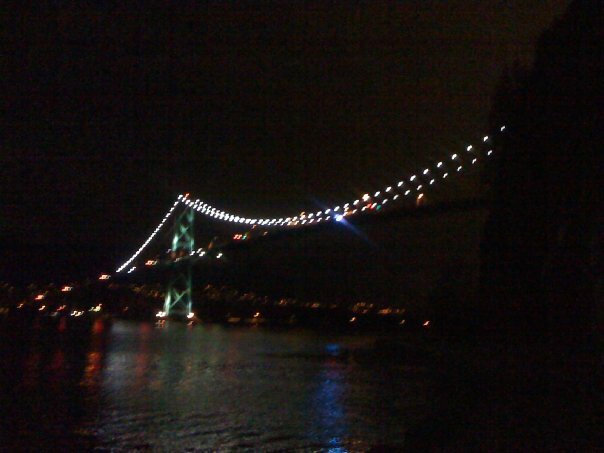 Lions Gate Bridge at 5:30 a.m.
Getting to the race proved to be the toughest task of my trip. After tracking down the local running store, I had planned to go to the store on the Thursday before the race and pay my $80 entry. One slight problem… on Wednesday I was summoned to be one of three reporters to attend the Tiger Woods press conference in Jacksonville, FL. My flight was at noon on Thursday. The running store opened at 8. I ran to the store as soon as it opened, left my check with the guy behind the counter, jetted off the Florida and hoped for the best. 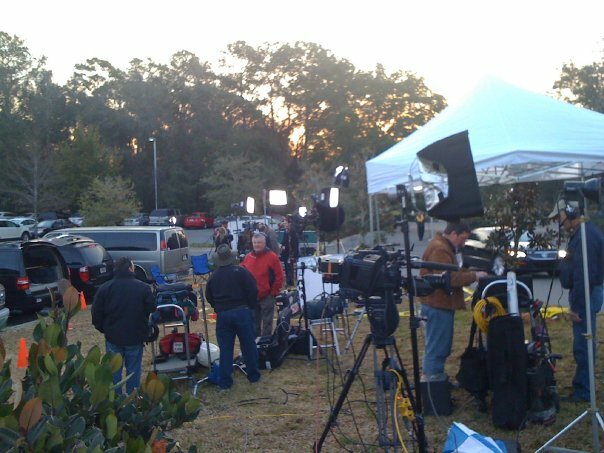 Here was the scene in Florida at 7:30 a.m. that morning. If you want to read more about the day, see here and here. After a few emails and phone calls to race director Mitchell Hudson, I finally convinced him of my unusual situation and he agreed to let me in. Thanks Mitchell. A BIG THANKS also has to go out to my new friend Pamela Felix, who agreed to give me a ride to/from the race about 20 miles outside of town. It’s true what they say… Canadians are VERY nice folks. On to the race… I didn’t want to disappoint Mitchell, so I decided to really go after it. It was a fun race on a fun course with some big hills and back-to-back downhill sections near the finish. I was super-psyched to finish in 1:31! 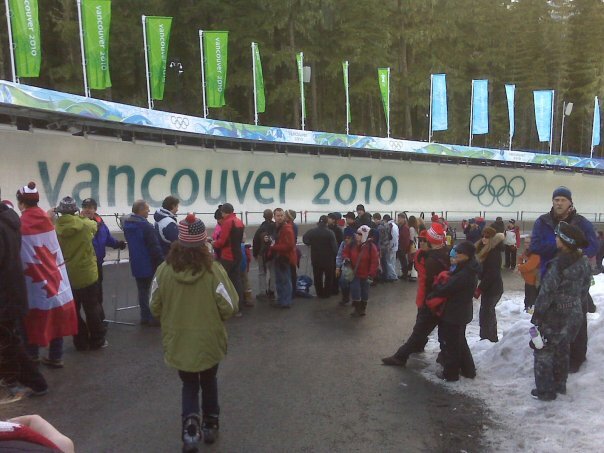 The race was held the day of the Canada-U.S. preliminary-round hockey game. So, being the little punk that I am, I decided to chant U-S-A, U-S-A! as I was approaching the finish line. It was the first time I have ever been booed at the end of a race. But it was all in fun. Since returning from Vancouver I have been very busy with family activities and other work-related things, so I have fallen behind on my training a bit. However, I did manage to squeeze in a 22-miler last weekend and did a 6-mile scouting run through the VERY hilly Druid Hills section of the ING GA course. I’m very happy I scouted it out and feel much more prepared knowing what I will encounter on the course. Because the ATL course is so hilly, I abandoned my goal of breaking 3:16 to try to qualify for Boston and instead am focusing on running at a good, comfortable pace and making it through all 26.2 without a hamstring blowout like I had did in NYC. 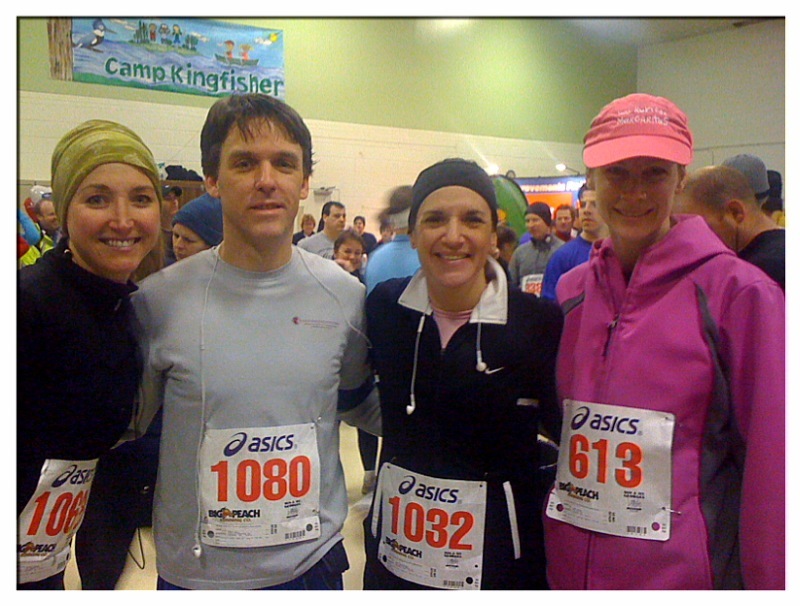 I will be running the race with a couple former colleagues as well as a group of friends from my neighborhood. It should be a great day. Hopefully, we have great weather like we did in 2009! As a sports writer, I’ve gotten the chance to do lots of cool things. In this sense, I’m truly fortunate. I realize that. However, I have become very jaded over the years. Sadly, it happens to most sports writers. It’s an odd thing. We get so close to the world of sports that it’s really hard to truly be a “fan” anymore. Occasionally though, a moment comes along that transcends sports and manages to breakthrough the crusty outer layer. That brings me to the Vancouver Winter Olympics. I’m here for three weeks covering the Games. 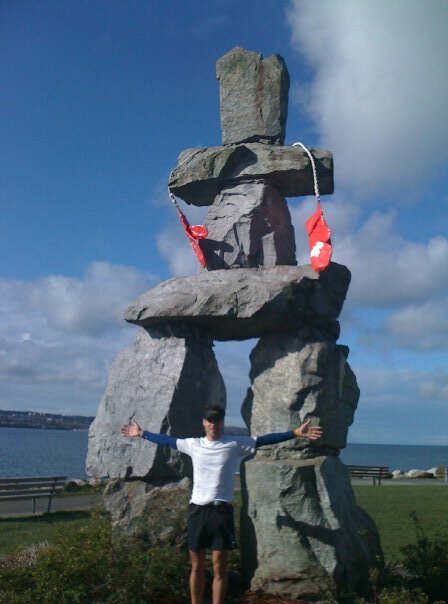 It’s hard to find time to run, but I managed to drag myself out of bed at 5:30 on the day of the Opening Ceremony and took off for nearby Stanley Park to run along the Seawall. I’m convinced that it’s one of the best urban parks in the world, along with Central Park in New York. As I reached what seemed to be about the 4-mile mark, I noticed a huge police boat out in the bay. This seemed kind of odd to me, but I carried on. Soon, the police boat shined it’s light on me. Weird, I thought. But still I kept running along. I was pretty much alone in the darkness. Soon, I began to realize I had no idea how far I had run. I thought of turning to my right and heading back through the middle of the park. But I had no idea where that would lead me. So I just decided to turn around and run back along the seawall. As I got about 2 miles away from where I began the run, I noticed some cyclists gathering in the dark along the roadside. This also seemed odd, but I simply figured that they were meeting up for a morning ride. Then I started to hear some cheering. At that point, I turned around and headed over to the gathering. “What’s going on?,” I asked one of the cyclists. “The torch is coming,” he said. THE torch?, I thought. Sure enough, flashing police lights and a cyclist carrying the torch came over the horizon. Wow! He stopped right in front of us and lit the torch of another runner. I was about 7 miles into my run and needed to get back to my hotel, but this opportunity doesn’t come along too often, so I ran alongside the torch for about a mile more as it was passed between three other runners. As it turns out, Arnold Schwarzenegger had started the run in the park where the police boat was. I never saw him, but that explains the light being shone on me, I figured. Luckily, I ran with my iPhone on this morning and managed to snap a decent picture of the moment. After going back to the hotel, showering and heading back out the door to get to the main media center, I once again “ran” into the torch on the streets of downtown Vancouver. Then, there it was again at the Opening Ceremony, being carried by my boyhood sports idol, Wayne Gretzky. There’s so much more to write about this day. But without a doubt, running alongside the torch will go down as one of the coolest moments I’ve ever experienced. I have 2 1/2 more weeks left here, but that’s going to be a tough one to top. Before the new year, I sat down and started to think about what sort of running goals I wanted to have. At the beginning, It wasn’t necessarily a matter of reaching them, it was just the idea of putting down on paper what I *wanted* to achieve. Whether I actually reached those goals was a totally separate matter. Here’s what I came up with. I’ve yet to try to figure out why I wanted to reach these goals I was setting for myself. I guess that didn’t really matter to me, but the more I think about it, I suppose it all goes back to the simple premise of what is the mental makeup of a person. Are you an achiever or, for the lack of a better term, a slacker? There are plenty of times in my life that I have — at one point or another — been considered a slacker. I can still hear the words uttered by many teachers and my parents when it came to school: “you’re a smart kid, you just don’t apply yourself.” Very true. Academic slacker – guilty as charged. But the idea of not “applying myself” never really applied to sports. Competing was always a passion. It helped that I was generally, if I can say this without sounded like a pompous jerk, above average at most sports growing up. But that didn’t mean I didn’t have to work hard at them. If it was something I loved (i.e. not school), I found it easy to want to work hard at it. It was a competitive rush. Now at 38, the so-called competitive sports I play — hockey and golf — are mostly just leisure activities. When I lace up my skates and play with the over-35 crowd nobody really likes to play against the ultra-competitive guy. He gets annoying pretty quick and usually finds himself dealing with a swift stick to the rib cage. That puts an end to that idea in a hurry. We all have jobs and a family to worry about. It’s just not worth it to go 100 percent on the ice anymore. But when it comes to running, there are other runners on the course during races, but the only person you are truly competing with most of the time is yourself. It’s the ultimate gut check. Do you have what it takes to push yourself beyond your comfort zone? In a nutshell, I guess that is the essence of my goals this year. Do I have what it takes? 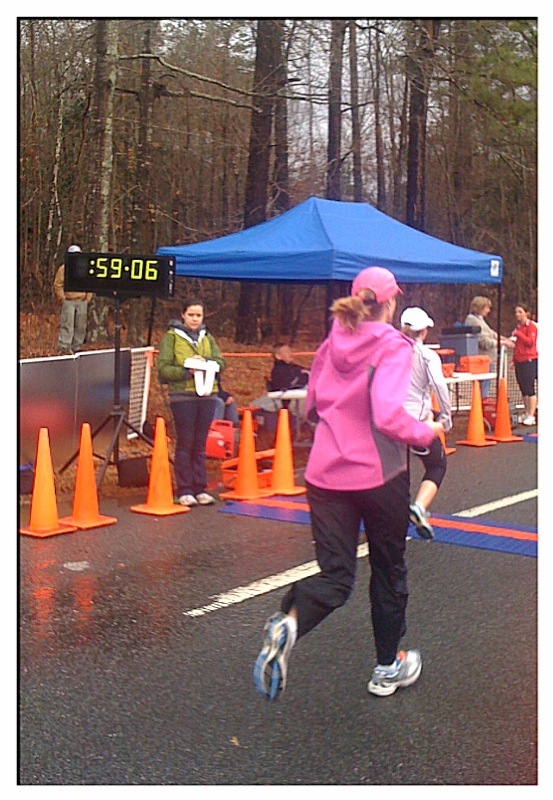 This self-examination began in earnest with Saturday’s 9th Annual Chattahoochee Challenge 10k. What better place to begin my quest than at the very first race I entered exactly a year ago. 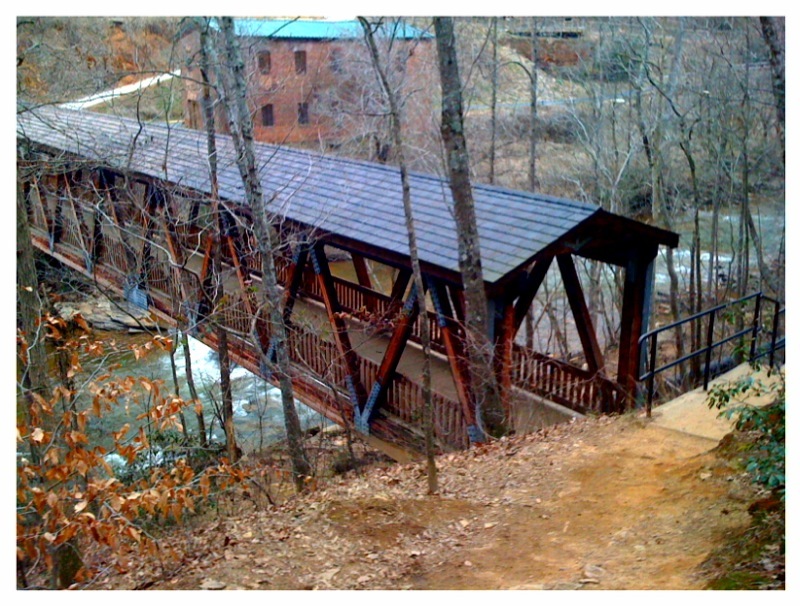 The Hooch Challenge is a very flat, fast course. It was the perfect place to go after Goal #1. A few days before the race, I saw that the Atlanta Track Club had published its qualifying times for the Peachtree Road Race. A sub-42 time would get me into the Sub-Seed group, the very first wave behind the elite runners. To get into the elite group, I would need a Sub-36 time! Even as a novice runner who didn’t pay attention in school, I’m smart enough to know that I wasn’t going to shave 7 minutes off my 10k time! Because of this, I always feel overmatched at the start line. When I look around and see the guys wearing small runner shorts and tank tops with their lightweight “fast shoes”, I always wonder if I should take a couple steps back off the starting line. Nah, “screw ’em” I think. Plus, I’m not sure I’ll ever be ready for the short shorts and tank top look. Not that there’s anything wrong with that! Then, BANG! The gun goes off and I find myself near the front of the pack for the first half-mile or so. But very quickly you can see who the elite runners are. By the 1-mile mark, they are off in the distance. It’s truly impressive to be close enough to watch them run, but I know that I have no hope of staying with them. On this day, there is a large field for the race. It’s a fast, flat course, so it draws a good crowd of about 900 runners. For the first mile, there are about 20 of us off the front. We are moving pretty quick, too. Not this year, I thought. I hit the 1-mile mark again at about 6:25. But soon after we hit this point, I found myself being dropped off the back of what I considered to be the lead pack. I wasn’t concerned though. I felt strong and settled into a comfortable pace of about 6:35. Turns out, I was being used as a rabbit/pace-setter for a second group of about 15-20 runners that were slight behind the lead pack. This was odd to me. People were actually using ME to pull them along? But don’t they know I’m just a recreational hockey player and not a runner? Silly people! We hit the 3-mile mark at about 19:30. I feel ok, but will I be able to keep this up for another three miles? Soon after we passed 3 miles, I notice a tall, older guy (in his late 40s, I figure) who had been hanging on my left shoulder for the past mile or so. We get into some banter about how strong the wind was coming off the river now and I tell him that I’m not much of a drafting shield for him. We smile and he says “I’m just trying to hang on man.” I hear ya brothah! I HEAR ya! Now, I ain’t no dummy. I watch enough cycling to know that part of being at the front of the pack means that you have to share the workload. He was much taller than me and I wanted him to get out front for a bit so I could get a break from the wind. He obliged, thankfully. I ran just off his shoulder for the next mile or so. This was a good break, but I soon find myself slipping back too far. He creates enough of a gap and I can’t catch him. Darn. I push on. This was a killer pace! I briefly think about pulling back off the pace, but can’t stand the thought of having the group behind me swallow me up. At Mile 4, a pig-tailed woman in her mid 20s pulls up alongside me and we run stride for stride for a while. This is an odd feeling. I run by myself so often and had been basically alone (the elite runners were far in front of me and the others were directly behind me) for most of the first 4 miles. Now, here comes this chick itching for a race partner for the final 2 miles. We’re shoulder to shoulder, stride for stride, going pretty fast. I think this is where being a “runner” would have helped me. I’m not at all used to this scenario and would actually rather have her go out in front of me. Instead, she was intent on staying elbow to elbow. What’s up with this chick, I think? Finally, I decide to slow it down every so slightly to let her get out front. She quickly senses this. “COME ON!” she blurts out. What the heck? This girl is crazy! “Just 2 more miles,” she says matter-of-factly. But I’m spent and tell her I’m saving myself for the hill at 5 miles. “Oh yeah, I forgot about that,” she utters, as she slowly pulls out in front of me. Truth is, I know who is out front and am very aware that she’s actually in third place among the women at this point, so I feel a little better yielding to her and her crazy pigtails. Plus, I’m almost 40 and she’s in her 20s! This is the logic I keep telling myself to justify getting BEAT BY A GIRL! Uh-oh, now there are two guys coming up alongside of me. They also slowly pull past me. I start to yell at myself inside “COME ON!” They catch crazy-pigtail-girl and give her the racing partners she was looking for. I watch the three of them run stride for stride in a tight pack about 10 feet in front of me. I desperately want in, but just don’t have that little kick I need. This is disappointing. I figure that these are the types of moments that runners are used to and know what to do. But I’m just a slacker hockey player, what do I know?! We all power our way up the course’s lone hill and head for the last turnaround. I loop around the cones and realize how fast the group is closing behind us. A year ago, this is the point where I REALLY faded. Not this time, I tell myself. I actually find enough energy to push hard back up the hill on the way back. I’m determined not to get passed at this point. But on the way back down the other side, another woman in her early 20s flies down the slope like an out-of-control gazelle. I’m tempted to let her go, but decide to let gravity take control and soon finding myself in a controlled arm-waving stumbling sprint downward. I know that this is suicide for my quads and calf muscles. After passing the 5-mile mark at about 33 minutes, I know that my sub-42 goal is going to happen. I’m psyched! I try to chase down gazelle girl, but she’s really pushing it. I’m a few strides back, but I keep the gap relatively close and empty the last bit I have in the tank to cross the line in 41:13. Pigtail girl gets me by about a minute and gazelle girl edges me by about 10 seconds. I finish 29th among the men, 33rd overall and 7th among my age group. Goal # 1 – DONE! The next time somebody pulls up next to me over the closing miles of a race, I figure I’ll know what to expect and will be able to rise to the challenge. But for now, I’m more than pleased with my effort. Even better, a neighbor of mine broke the 1-hour mark for the first time in a 10k. I was psyched for her, too! It was a great race and look forward to returning next year. Does a year actually make a difference? Holy crap. I actually just wrote that. Yes, that JUST happened! As a writer, I secretly yearn to read laughable clichés such as that first sentence. It’s just so horrendous and unoriginal. Yet, go ahead, do a Google search and see what you find. It’s everywhere! Heck, the New York Daily News did it just two weeks ago. Fantastic stuff! Not quite sure what I’m getting at? Well, in the great words of the legendary reporter Dickie Dunn from the movie Slapshot. What the heck does all of this have to do with running, you ask? Well, I am fast approaching the one-year anniversary of the first race I ever competed in — the Chattahoochee Challenge 10K. Wow, has it already been a year? Sure enough, I flash back in time and find my post on that first race. It was a great start and a HUGE learning experience. I’m psyched to see how far I have come. I have run that “course” so many times on training runs now that I feel I might even have a “home field” advantage when this year’s race rolls around. Or maybe not… we shall see. Since that first race, I have run a couple official half marathons, the NYC Marathon, a bunch of 10ks and a handful of 5ks. In each race I have learned a little bit more about myself and what it takes to be a “runner”… not somebody who jogs, but somebody who RUNS. To me, as a competitive person, there’s a definite difference. There’s certainly nothing wrong with being a jogger, so to speak, but that’s just not my style. I like to challenge myself and see where I can stack up. I certainly don’t get upset when I fail to win my age division (I have finished 2nd twice, and 7th overall in another race — not that I’m keeping track, of course! ), but I do have a clear knowledge of when I have “failed” in a race or during a particular run. When that happens, it never makes me want to quit running, it just makes we want to work harder and learn a little more. As a quick example… This recent run was incredible on so many levels. 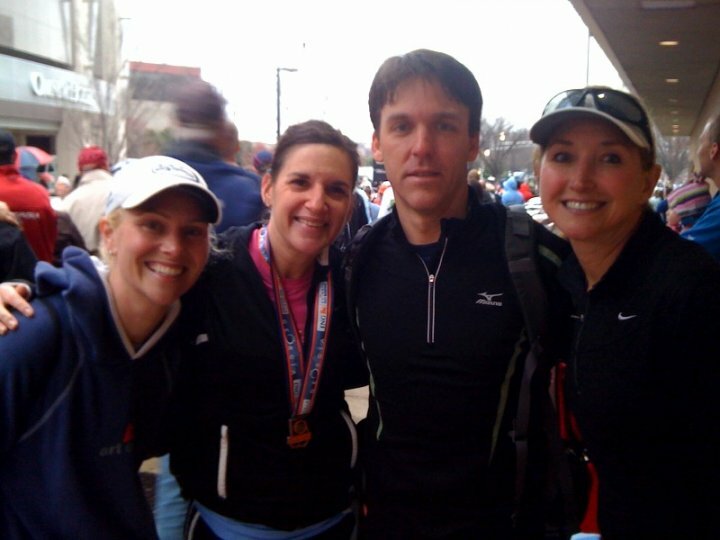 Most notably, I felt like I could have gone the full 26.2 on this day. I only stopped because I didn’t have another hour or so to spare. That’s it… THAT is why I stopped? Really? That’s still unbelievable to me. I also felt stronger during the 19th mile than I did during Mile 1. I credit this to all the things I have learned over the past year, especially pace and stride. Of course, it has taken me a few days longer to fully recover than I had expected, but for the most part I felt great after the run. With all of this said, I’m anxious to run in my “one-year anniversary” race in early February. I’m curious to know exactly how much of a difference a year actually does make! Truth be told, I was pressured into it. It seems that all the “cool people” go trail running. And because I always want to be one of the cool people, I recently gave into the peer pressure and decided to hit the trails. One morning about three weeks ago, I came across a group of runners in a parking lot as the sun was rising. I was headed out on a 15-mile run on a long, flat running path. The temp was in the teens and I was feeling very proud of myself for getting out of bed and tackling the road for such a long run under such extreme conditions. And then I asked the others were they were headed. “Across the street, there’s a great section of trails,” one of the runners said. My interest was peaked but not enough to join them. They strapped on their headlights and headed into the woods. I instead headed down the boring, flat trail. But the entire time during my run I couldn’t help but wonder what sort of fun the others were having on the trail in the woods. I was boring. They were cool! Could it be true? 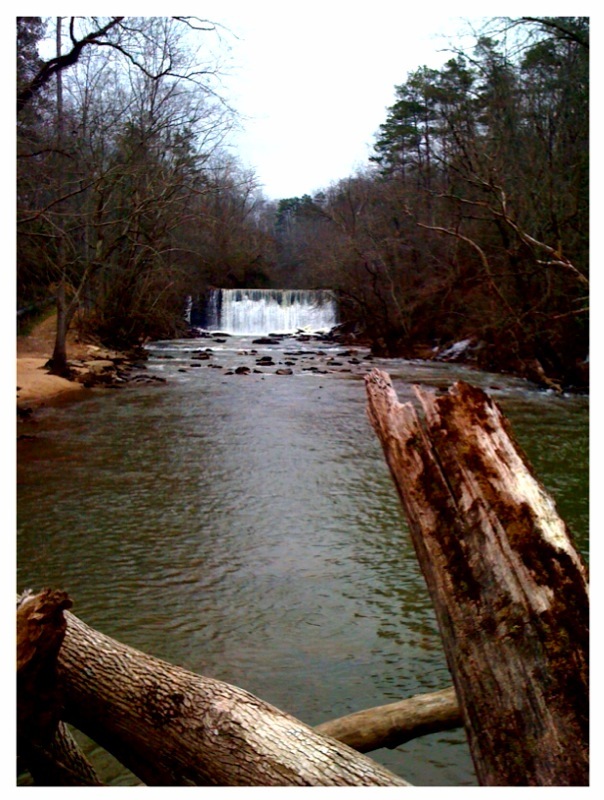 So… this past weekend, I headed back to the park. It was still dark at 7 am, so I did a quick 5-mile run on the flat path to kill some time as I waited for the sun to reach the inside of the woods. When it did, I ducked into the wilderness known as Vickery Creek. WOW! What have I been missing?! I once hiked in this area with my family, but running through here was a much different experience. I didn’t have much of a plan other than running a total of about six miles. I kept taking one trail after another until I had reached my distance goal. Having no plan, no idea where I was going and no asphalt to deal with, kept me smiling for almost the entire run. 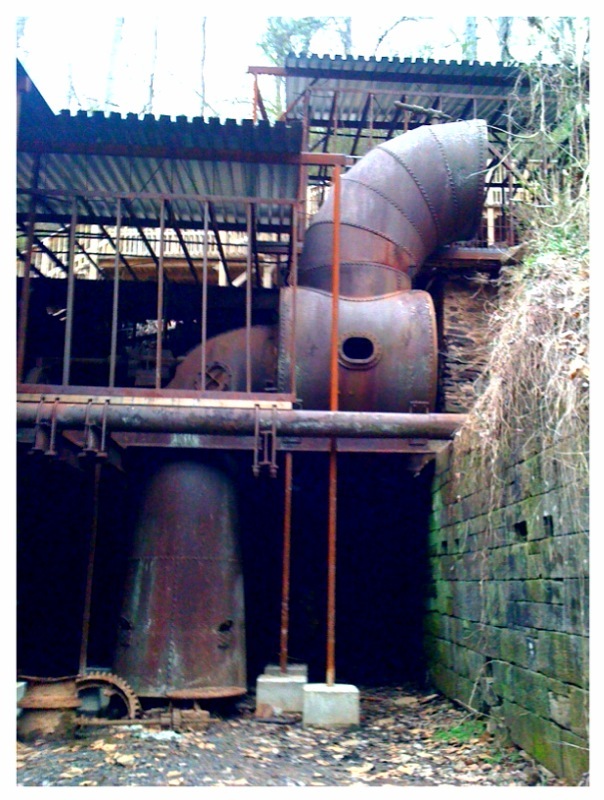 When I got down to a section along the creek, I crossed the water by walking across a huge water pipe. I thought there would be an easy way back across after, but instead I found myself needing to exit the woods and head back to the roads for a brief section of neighborhood running before circling back to get on the trails. 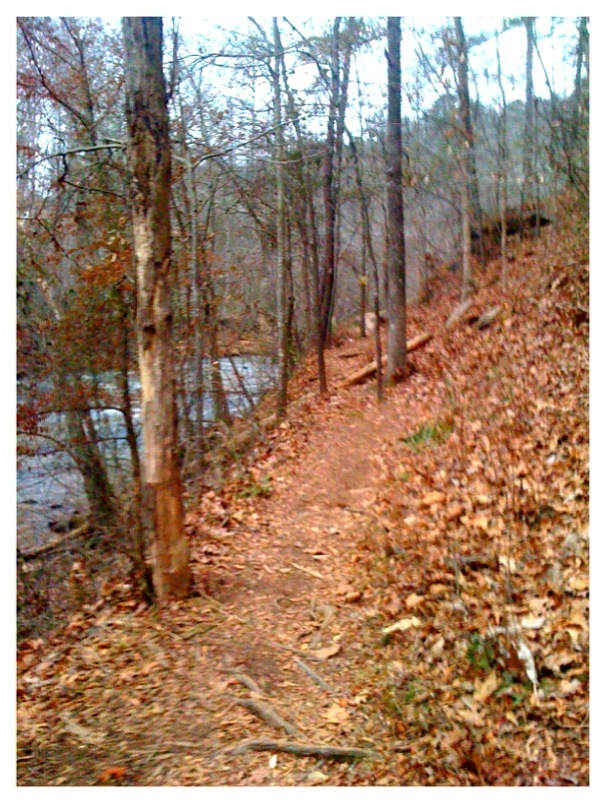 I can see myself making these trails a common part of my running routine. Here are a few pics. They are all iPhone photos, so the quality is not the best but you can get the idea. This is right at the start of the trail as you head down along the river before heading up to the main sections of the trail. This is a view from the middle of Vickery Creek. I’m standing on a big water pipe. 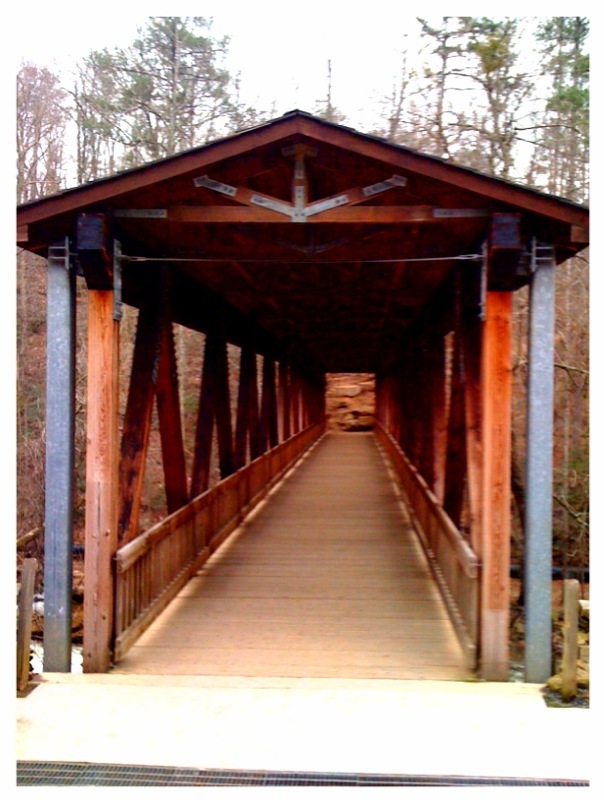 Her’s a covered bridge that crosses the creek over the the Old Roswell Mill. And here’s a shot of what’s left of the Old Mill. This was a GREAT run. I am definitely headed back there again. Now I know what all the cool people have been talking about!